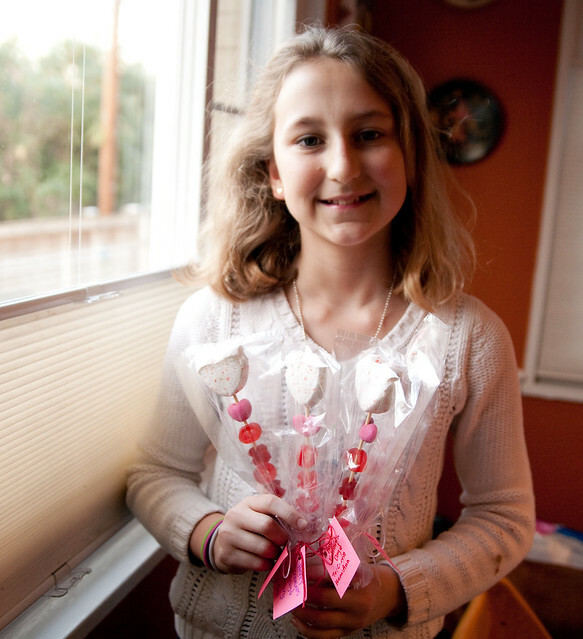 We welcome 11-year-old Ana Duss as today’s guest blogger. It’s almost Valentine’s Day, so I knew I needed to make something for my friends. I found a lot of inspiration from YouTube videos and Pinterest. 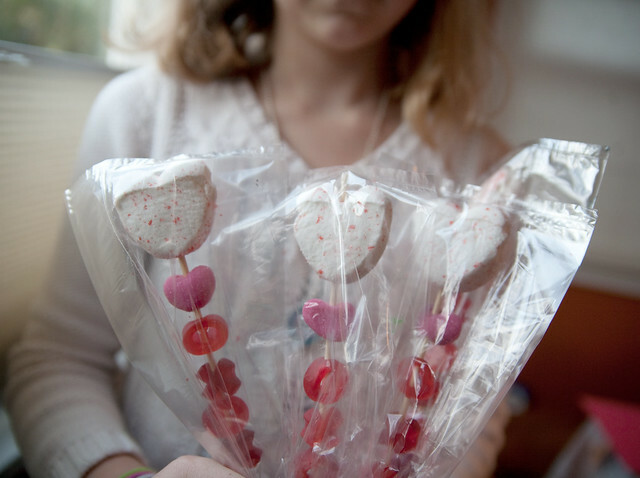 After thinking long and hard about what to make for my friends, I decided I would make a few simple candy kabobs with red, pink, white, and purple candies. I told my mom about my idea, and she took me shopping to get the things I needed to make my kabobs. 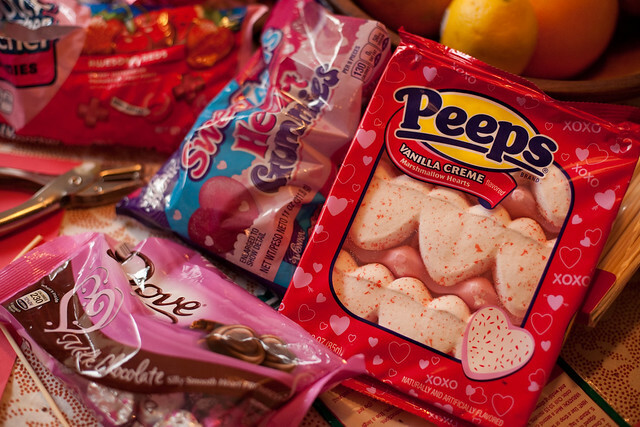 I got Sweet tart gummies (in purple and pink of course), Jolly Rancher gummies (I found these X and O shaped ones that were really cool), a bag of Dove chocolates (shaped like hearts), and delicious white and red Peeps marshmallows shaped like hearts as well. A few days passed and I decided I needed to make these kabobs pronto! So I spread my supplies out on the kitchen table and went to work. My mom had gotten some clear treat bags, string, construction paper, and a bag of skewers at Michaels a few day before. 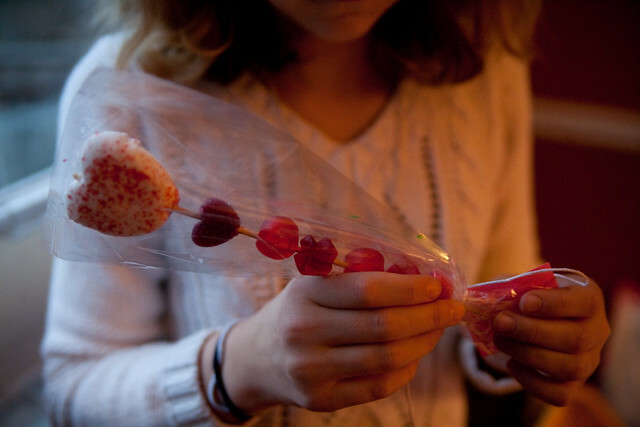 First, I took a skewer and tried to poke it through a chocolate heart. Unfortunately, the chocolate just cracked and broke in half. After trying a few more chocolates, I realized these weren’t going to work. 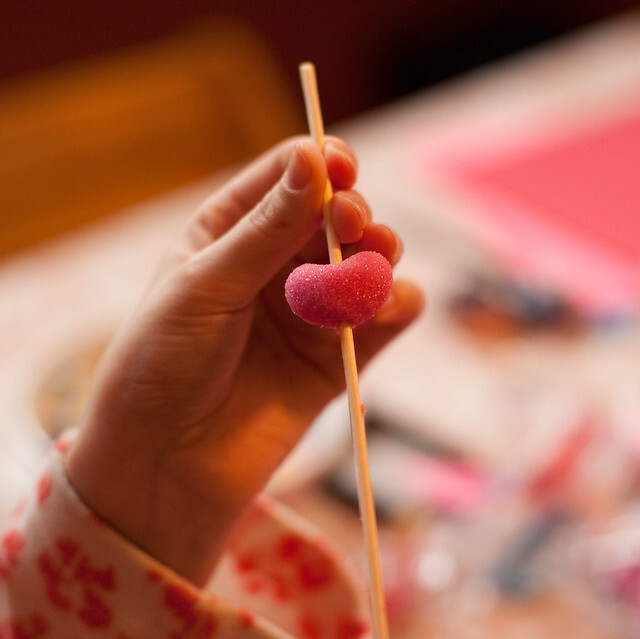 So I set them aside and started trying to skewer the Sweet Tart gummies….. and they worked! I kept on going with the other two candies and finally finished one. This was my tester, it was delicious. After making sure my candy kabob was spot on, I finished all my other ones! With the construction paper, I cut out squares and punched holes in them with a hole punch. Then, wrote whomever’s name I was giving it to on the slip. After, I tied it onto the kabobs (they already had a clear treat bag over them). 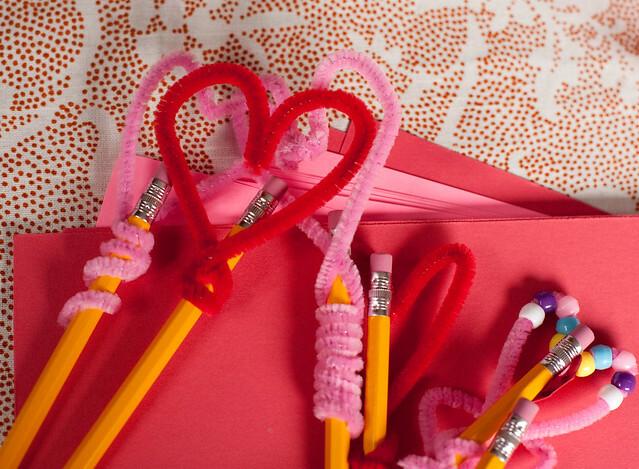 Across from me, my sister sat making her Valentine’s Day pencils for her classmates. 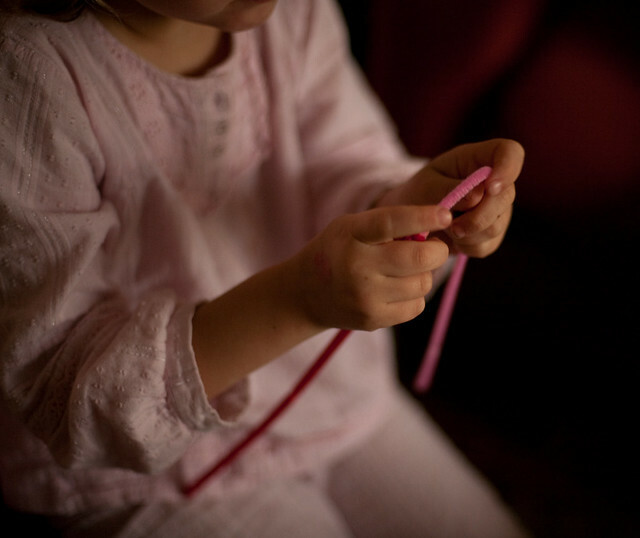 My mom had gotten her pony beads, pipe cleaners, and regular unsharpened pencils. 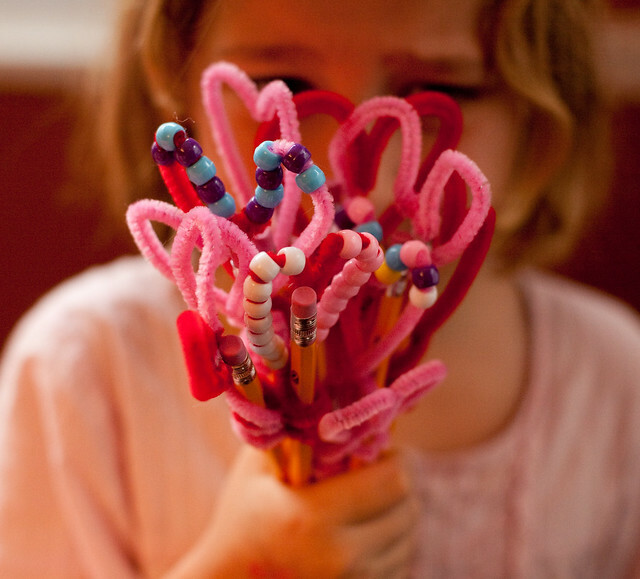 The idea is that you take a pipe cleaner and a few pony beads, then bead your pony beads onto the pipe cleaner and then twist the pipe cleaner into a heart on the eraser of the pencil. It was a super cute idea, and they turned out looking great! 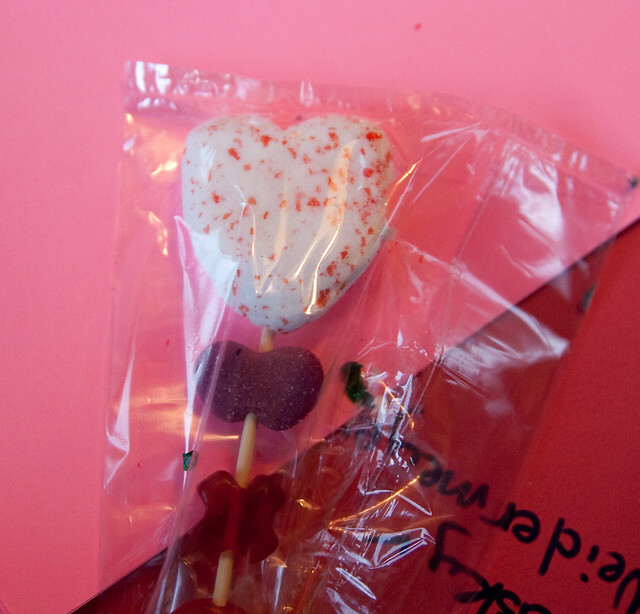 Nadja and I both had a fun time making our Valentine’s Day favors! Happy Valentine’s Day! Those kids are creative geniuses, just like their mom!